The 2016 “Annual Dialogue Report”, prepared by Media Tenor and just released, examines ways to build trust and increase dialogue across religious faiths. In the preface to the report, Michael Møller, Director-General of the United Nations Office at Geneva, notes that “the UN Climate Summit in Paris at the end of November and the 2030 Agreement on Sustainable Development Goals in New York last September showed what can be achieved if all understand the need for resilient solutions. 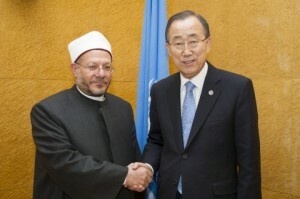 I am optimistic that the Secretary General’s Plan of Action to Prevent Violent Extremism, launched on January 15 in New York, and the Initiative by the Grand Mufti of Egypt [which seeks to deepen knowledge about and address the underlying causes of extremism and terrorism], announced on 20 January in Davos and reaffirmed at the United Nations in Geneva, are sending a clear message: we are all united in our efforts and desire to end violence.” The Director-General goes on to highlight trust between people as the glue that binds us together as families, neighbors, nations and a global community.